There’s a magic moment as the First Great Western train leaves Exeter when you finally know that you’ve quit London. Suddenly the monotonous banks of earth and fields of green give way onto what seems like an endless expanse of water. The wet sand is reflecting a late September sun and small boats lean drunkenly in all directions, patiently waiting the return of the tide to float them back to sober and dignified bobbing. It’s enough to make even the most tired and jaded Londoner perk up and look forward to the upcoming weekend break. With no car to worry about the only pressure is getting through the wodge of Saturday papers sprawled across the table. Our destination, Bedruthan Steps is 200 or so miles away and it’s good to let someone else do the driving for once. The sun has gone by the time we reach Bodmin Parkway station. Just as the weatherman predicted, the sunny spells all over England are not appearing here. The clouds are down to head height and the rain is seemingly never ending and the swish of the wipers seem to only mock our earlier cheerfulness. 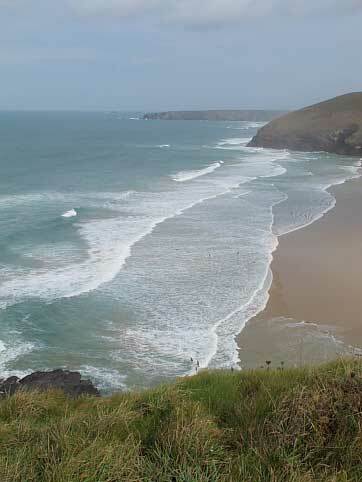 This is North Cornwall though and the weather can change in the time it takes to unpack a case, it’s one of its charms. Approached from the rear our destination Bedruthan Steps Hotel, Cornwall’s Hotel of the Year 2010, is a bit of a shock. Designed and built in 1960, possibly by Albert Speer from the looks of it, it has more of the appearance of an institution than a hotel. It’s deceptive though because the hotel saves its charms for the front. Stepped down the hillside of Mawgan Porth bay, it has grass-covered roofs to make it ecologically effective, something they thought of well before it became fashionable to do so. Inside its warm and welcoming, as a family owned hotel often tends to be. The rooms are comfortable, spacious, and well appointed. It’s only when you draw the curtains though that the real bonus hits you. The rain has miraculously stopped and we can see the beautiful bay below us, the waves are rolling in to tickle the blond sands and out at sea the sky is cracking into blue. It’s time to run to the beach. Well it’s more a dignified stagger down the steep path from the hotel really. Good-looking young people in wetsuits, also charging for the late afternoon sun and all clutching surfboards, occasionally overtake us. The drawl of Chelsea hangs in the air long after they have politely pushed past us. Down on the beach the sand is clean and fine, the tide is coming in but the beach still seems endless and dogs are taking their owners for a walk and both are bounding about happily. We walk to a slate outcrop and simply sit and do nothing, watching the surfers and admiring the way that sky is in constant flux of cloud formation. A stiff climb back to the hotel reveals more of what it has to offer. Indoors and outdoors pools, a luxurious spa, a tennis court, a mini-assault course and stuff to keep children happy everywhere. This keeps us happy too as it means the kids aren’t underfoot in the hotel proper. Dinner is well-priced £30 for three courses. Local mackerel is very good indeed, the hotel has a strict policy on local sourcing and sustainability and the pollock is a decent dish too, the only off note being the rather vinegary anchovy fillets underneath. Chef isn’t going to win any Michelin stars but a strong beef dish showed he has a good grasp of flavours generally and a keen eye on what’s trending. Thankfully the hotel also has an admirably strict policy on kids dining, with a separate room for those kids too young to behave. From the sounds coming out of there, it seems a circle of hell Dante didn’t consider and we’re glad we are well out of it. The lounge has a local group playing traditional music on traditional instruments (and with traditional haircuts too) all part of the month’s harvest festival celebrations involving local produce and local beer. The latter numbs the ears nicely and we end the evening slumped in a benign haze letting the nonny nonny sounds drift over us. The next morning after a good cooked breakfast we’re out early. For those that don’t surf the alternative in Cornwall is always walking. Leave the hotel in either direction, either to Watergate Bay or the Bedruthan Steps themselves, and you’re soon onto narrow coastal paths; sheep staring at you with their mouths full on one side, pant wetting glimpses to a seething sea on the other. It’s just wonderful weekend walking. 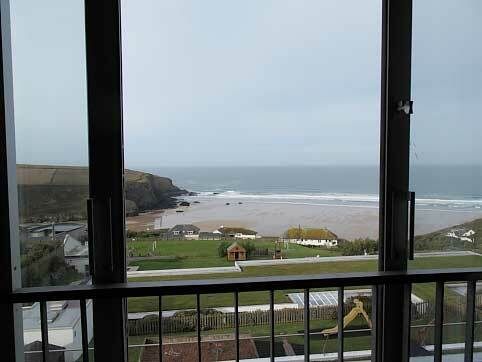 Bedruthan Steps Hotel has an enviable location and is extremely family friendly, bending over backwards to accommodate parents’ needs. For those looking for a couples’ weekend instead, their sister hotel Scarlet, a short step away, is adults-only and very chic. We were back in London by 6:30 having left our hotel at 1:30 and now relaxed and recharged. 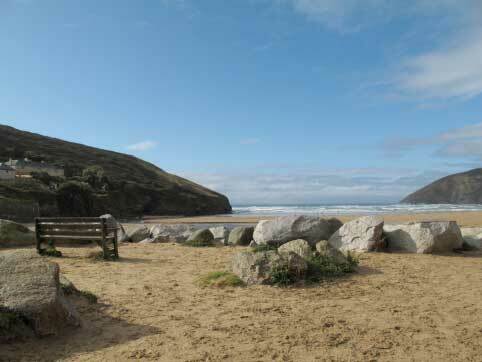 Only a short step away, Bedruthan Steps Hotel is a quick route to a weekend break that’s refreshingly different. Weekend return to Bodmin Parkway around £80 pp. Cab to Bedruthan Steps Hotel is £39 each way when booked through the hotel. 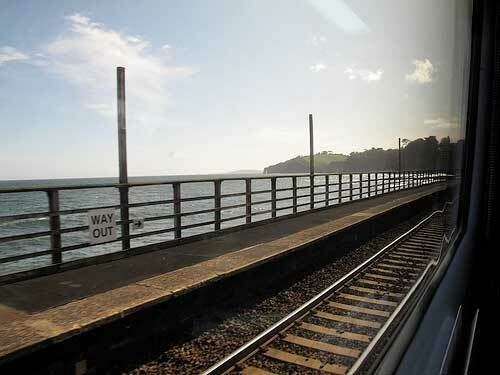 Newquay Station is nearer – no train service from Newquay to London on Sundays.